1. Volume - Obviously having microphones will take care of this one. However, even without microphones, you can create "triggers" to focus their attention: "when I say Cheerio clap three times and look this way", "repeat after me", etc. 2. Round Tables - This configuration is great for having to do a ton of writing, but it absolutely kills a trainers ability to maintain order, attention and focus. That is why I use the technique of packing the audience up to the front of the room (or the back) with just their chairs and their books. It gets everyone close together. It gets every one's chair and thus their attention focused one direction. It removes the energy gaps between the people. It takes away everything on the tables that could distract the audience. 3. Listening Fatigue - I stick to the 7-minute rule. The audience needs to change the way they input information every 7-minutes or so. The different techniques you can use are: talk to them, have them talk to each other, have one of them talk to the group, have a group discussion, have them read something, have them think/reflect, have them listen to music/audio, have them watch/listen to a video, have them do demonstrations for each other, do an activity, or do a demonstration. By sticking close to this time rule, you create a pace to your workshop that doesn't allow for the audience to lose attention. 4. Information Overload - Especially in long-days or long-sessions format, this concept is critical. Information overload kills attention span. The best formula is to take the very top one, two or three concepts or ideas or questions or training points and go deeper into those few. This formula trumps the "cover 10-15 points" formula every time because after one of two hours the audience's information receiving pipeline is full and they start shutting down. They are getting way too much information to handle and ultimately they learn less even though more content is given. 5. Hearing the Same 'Ole Stuff - As soon as your audience starts to hear something being covered that they have heard before, their natural response is to shut down their listening. Our task as presenters is to say the same 'ole stuff, but to say it and debrief it and "activity" it in new ways using new unique language and new unique labels. 6. Lack of Rapport With Presenter - A few rapport-building techniques: humor, mingling with the audience, learning their names, having high expectations of them, laughing at yourself, making your content fun, putting a competitive drive into your content. The primary reason why I get high remarks from audiences is because I connect with them on an emotional level. It just so happens that the emotion I spark in them is primarily humor. Different styles call for different emotional connections. Every style has an emotional connection that can be brought to the table, it is just a matter of figuring out where that sweet spot is for you. Great presenting is about transferring emotion. And by tapping into that vein with people, they almost can't help but stay attentive and focused because they are drawn to you and the emotions you are stirring in them. 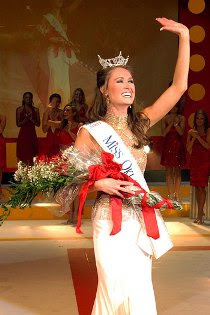 Congratulations to Makenna Smith, Miss Oklahoma 2007. Makenna is one of our presentation and pageant coaching clients. My business partner Jonathan Smith (http://www.jedwardsmith.com/) is now shooting for Miss America number three (the current Miss America, Lauren Nelson, and last year's Miss America, Jennifer Berry, were both clients of Jonathan).